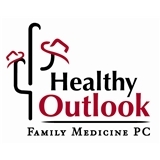 Healthy Outlook Family Medicine PC (Phoenix) - Book Appointment Online! Healthy Outlook Family Medicine, P.C. is a medical practice dedicated to the treatment of families. We pride ourselves on our family-centered approach, treating infants through seniors with care, compassion, and clinical excellence. While we strive to achieve excellence through evidence-based clinical guidelines, we also believe our treatment should be individualized to help our patients. We emphasize prevention of disease and healthy lifestyle choices, as well as educating our patients about treatment options. We try to provide care in a casual, welcoming, family friendly office. As a convenience to patients, we have regular and sick appointments beginning at 7 am. Rather than late day extended appointments, we treat you ahead of schedule and get you feeling better early in the day! This is a great benefit for anyone with a busy work schedule. Please also see the provider profile. Jessica was great, she was kind and thorough. Amazing! I have finally located a doctor who is knowledgeable, logical, and so very practical. She is a gem.